One of the things we were most looking forward to on our visit to Seoul was a morning tour to the DMZ. 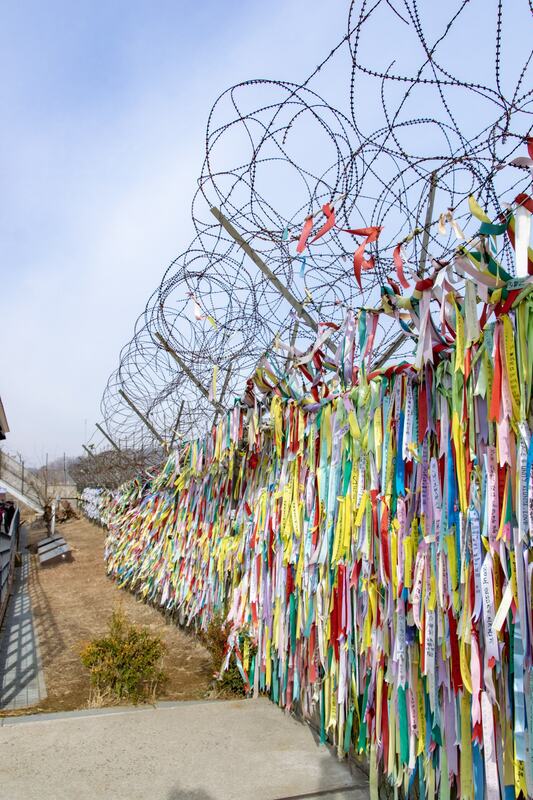 This unique area essentially acts as the boarder between North and South Korea, and is known to be one of the most volatile and dangerous boarders in the world. Of course, a tour to the DMZ does not put you in any danger, but it does give you a fascinating insight into the history of the two Koreas. We were booked to visit the DMZ on our first full day in Seoul with VIP Travel, and were picked up from our hotel promptly at 7:30am before meeting the rest of our group at a nearby hotel. From Myeong-dong it takes about 45 minutes to an hour to reach the DMZ area, so we settled in for the ride, watching the South Korean countryside whizz past our bus windows. From the minute we left the city our wonderful tour guide Hyeyoung was busy telling us all about Seoul. Pointing out different areas of the city to us and giving us a bit of background information about South Korea and the Korean War. 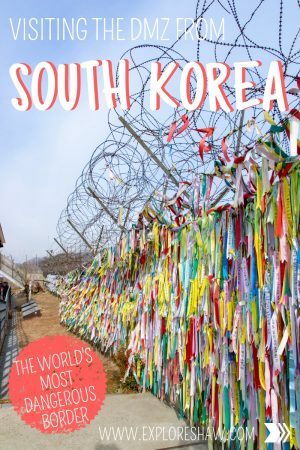 She told us about where we were going, why it was so significant, and a bit of the history from a local’s perspective about the insane divide between North and South Korea. We tried to keep notes of as much as she shared as possible so we could share it here with you. Here’s a little bit of a look into our day at the South side of the DMZ. Basically the DMZ, or Demilitarised Zone, is the border that separates South Korea from North Korea and acts as a buffer zone between the two countries to prevent military action being taken by either country. In 1948 the line that divided the Korean Peninsula become a de facto international border after the two countries established their own identities as the Democratic People’s Republic of Korea (also known as DPRK or North Korea) and the Republic of Korea (also known as ROK or South Korea). Then, after the Korean Armistice Agreement that put a stop to the Korean War in 1953, the DMZ was created to separate the two countries and it has remained that way ever since. 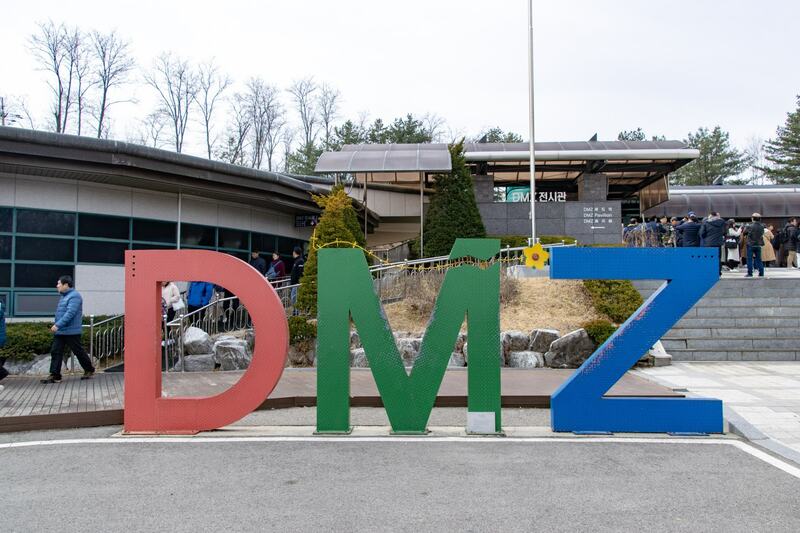 For over 50 years, the DMZ has been considered one of the most dangerous borders in the world, due to the unpredictable and volatile nature of the Kim family in power in the North. 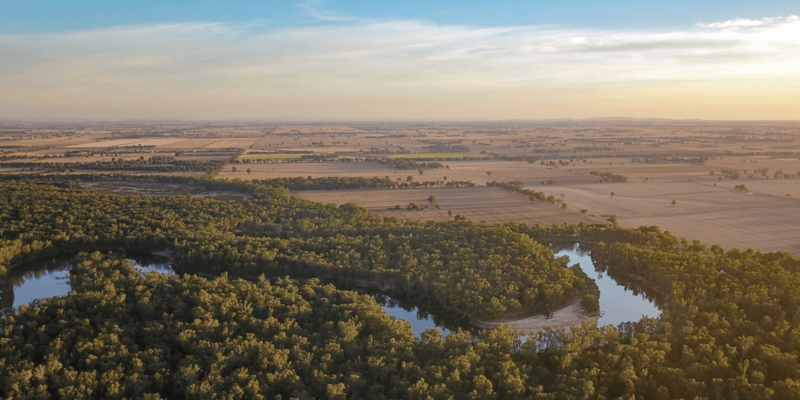 It is 250 kilometres long and about 4 kilometres wide, with a 2 kilometres buffer zone on either side of the actual border. Our first stop for the day was Imjingak, which was where our guide stopped to purchase our tickets for the DMZ zone. 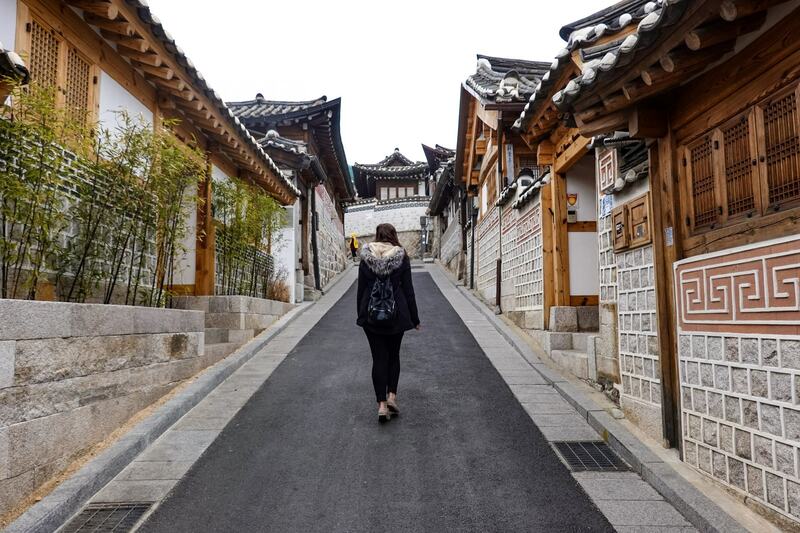 It is the last village in South Korea before you enter the DMZ area and has plenty for you to check out all on it’s own. 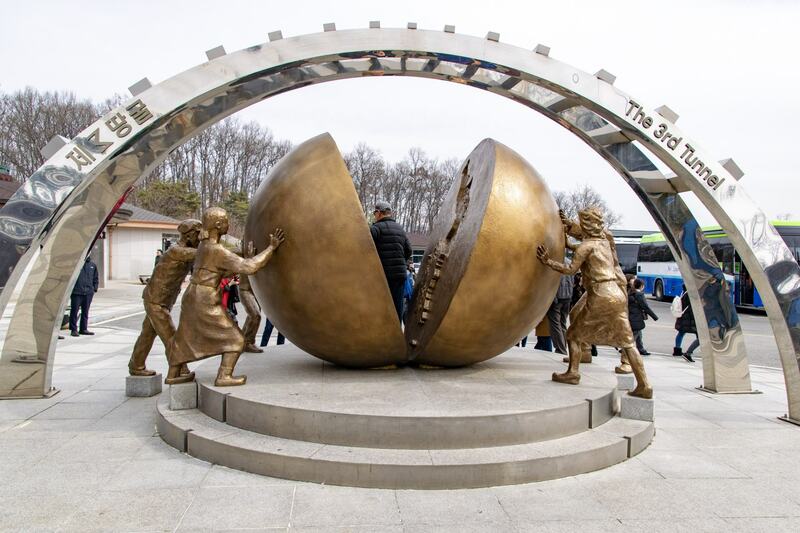 The park was built in 1972, in commemoration of the refugees who left North Korea during the Korean War who can no longer return home and in the hope that someday unification would be possible. 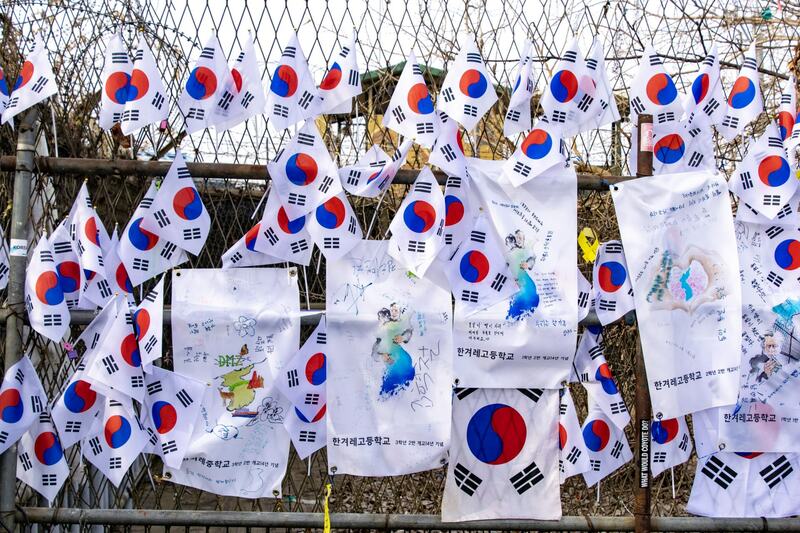 Imjingak is the last place in South Korea you can visit before entering the DMZ zone. You do not need passports or permits to visit the park and it is easily accessible to anyone visiting South Korea. Mangbaedan Alter – where Korean’s separated from their families in the North would visit to perform ancestral rites by bowing to their hometowns each New Year’s Day and Chuseok (Korean Thanksgiving). 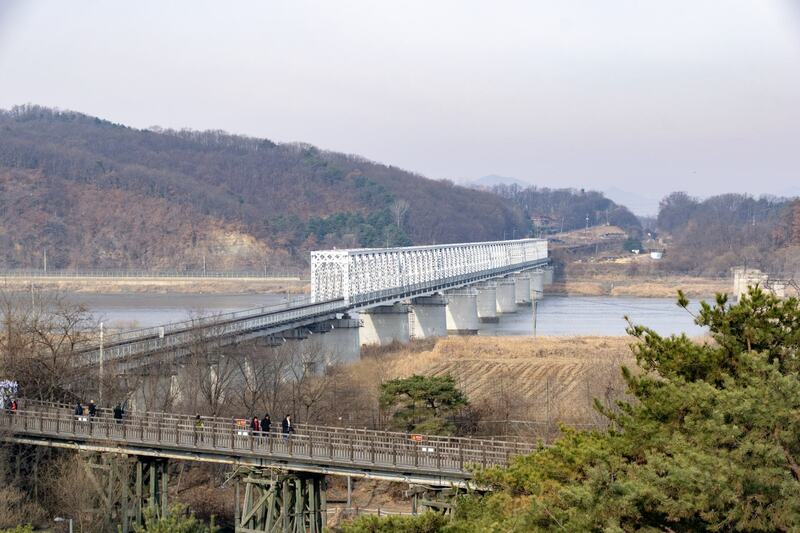 Freedom Bridge – after the Armistice Agreement was signed, 12,773 South Korean prisoners of war were returned from North Korea and crossed the Imjin River via this bridge to return home. 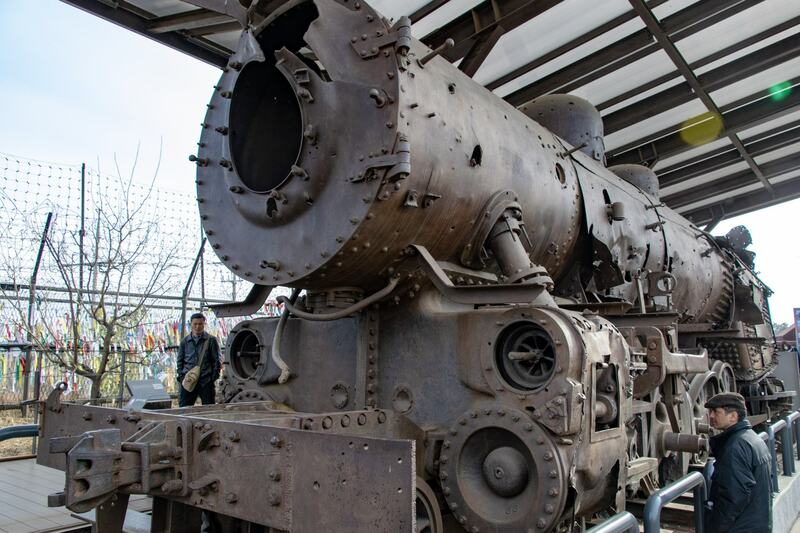 The last train to cross the North Korean border – in the park you can also find a rusted steam train, that is said to be the last train to ever cross the northern border (as seen in the image above). The train previously ran on the Gyeongui Line, but on it’s last trip it was heavily bombed and brought to a stop by North Korea. It has remained as it was during than war for more than 50 years. The DMZ NOW Marketing Hall offers all kinds of information relating to the DMZ in many different languages and is a great place to walk through if you’d like to learn more about the area. 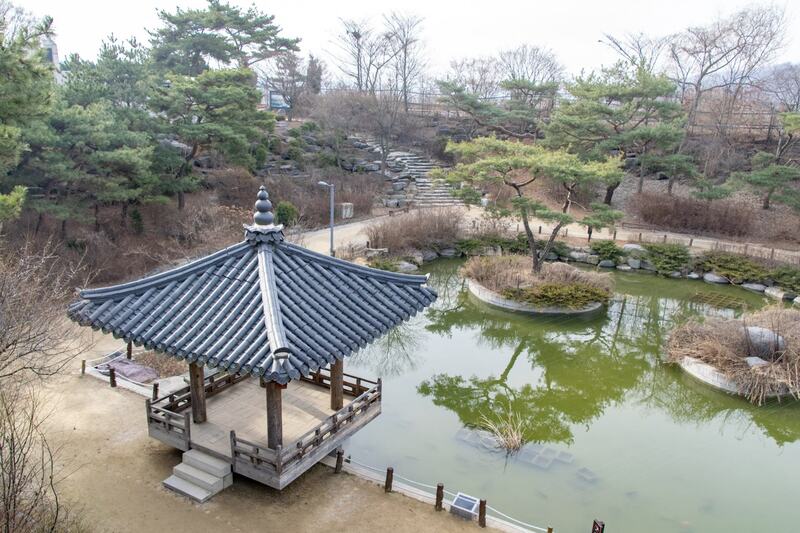 Nuri Peace Park can also be found at Imjingak, created to serve as a symbol of the peace and efforts of reunification at Imjingak. There are many great works of art spread across the field and various exhibitions and performances are often held in the park. The Unification Pond – in the shape of the Korean Peninsula was also built in the spirit of reunification, as a symbol that both sides of the DMZ are one country (image below). From the viewing platform on top of the building in Imjingak Park you can see views across to the Freedom Bridge and further across the river. This part of the country is still considered South Korea as we had not yet entered the actual DMZ zone. If you’re looking for a drink or a snack before you head into the DMZ check out the tiny cafe located just inside Popeyes. They had some of the best hot chocolate we’ve had in Asia, as well as some delicious home made cookies which kept us going through the cold morning exploring the DMZ. Hyeyoung purchased our DMZ tickets while we had a look around the park and then we were back in the bus, ready to cross the Military Demarcation Line and get our own glimpse into North Korea. We stopped at the check point, where a young South Korean military official jumped on board the bus and checked all our passports, before waving us on to continue the tour. Our first official stop once we had cross the line into the civilian restricted area was the Third Tunnel. Since 1974, more than twenty years after the Armistice Agreement was signed, four different tunnels have been found in South Korea, where the North have tried to cross the DMZ. The tunnels were designed for an invasion of the south and it is said that the Third Tunnel would have been capable of moving a full division of over 30,000 soldiers per hour. The Third Tunnel was our first official stop along the DMZ. We hopped off the bus and filed into a small room with displays about the tunnels, how they had found them and some general information about the DMZ. We followed Hyeyoung around the room as she explained different parts of the DMZ to us, as well as the history of the Third Tunnel. We were then directed into a small theatre where we watched a 10 minute video on the history of the four tunnels that South Korea have found along the DMZ. The video was a little old, and it could be said that much of it’s contents was kind of South Korean propaganda, but it was very informative none the less. Before we knew it we were facing the tunnel ourselves, ready to climb down and see what it was all about. Since discovering the Third Tunnel in October 1978, South Korea built another tunnel down to it, so it can be accessed by tourists and visitors. This tunnel, let’s call it a walkway so we don’t get too confused, is a steep climb down about 350 metres, taking you to the actual tunnel built by North Korea. From the end of this walkway, we walked in a single file line through the actual tunnel, right to the end where three walls were built by South Korea to block the tunnel off from the North. The whole tunnel is 1.635 metres long and although the guides said it was 2 metres high and 2 metres wide it definitely felt a little lower than that. We had to duck almost the whole way down the tunnel, despite the fact that I am only 167cm tall. There was water on the ground as we walked, only a little bit seeping through the floor that had been laid. When you’re standing at the end of the tunnel, next to the first of the three walls built by South Korea to block the tunnel, you’re standing about 170 metres from the North Korean border. That’s about as close as you’re going to get without actually boarding a plane to visit! Over the years North Korea have claimed that South Korea was actually the ones building the tunnels, trying to invade their country. However, as you can clearly see inside the tunnel, the dynamite blast lines show which way they tunnel was being built. It would be so interesting to take the DMZ tour from the North Korea side and see what they are trying to tell people! The next stop was the Dora Observatory, where you actually get to have a look into North Korea. 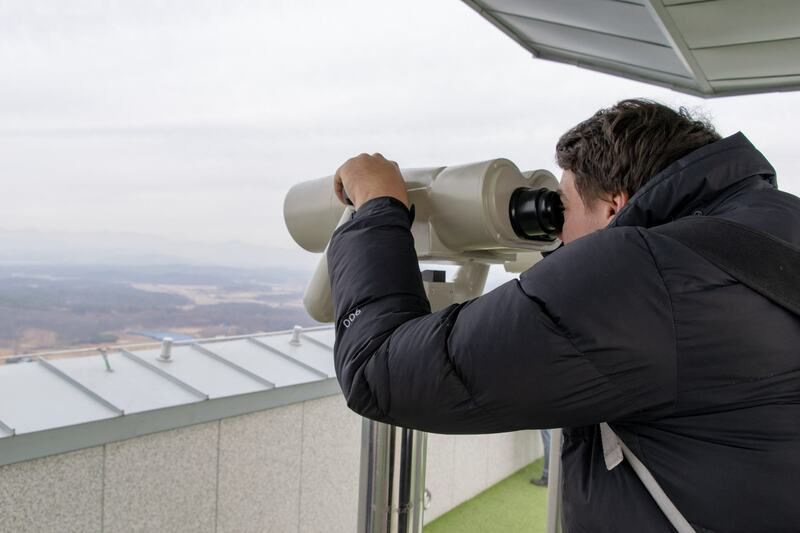 Sitting at the top of Dorasan, the observatory offers views over the DMZ and straight into North Korea itself. Depending on the weather on the day of your visit you can see some of the cities, high rise buildings and flag poles in North Korea. 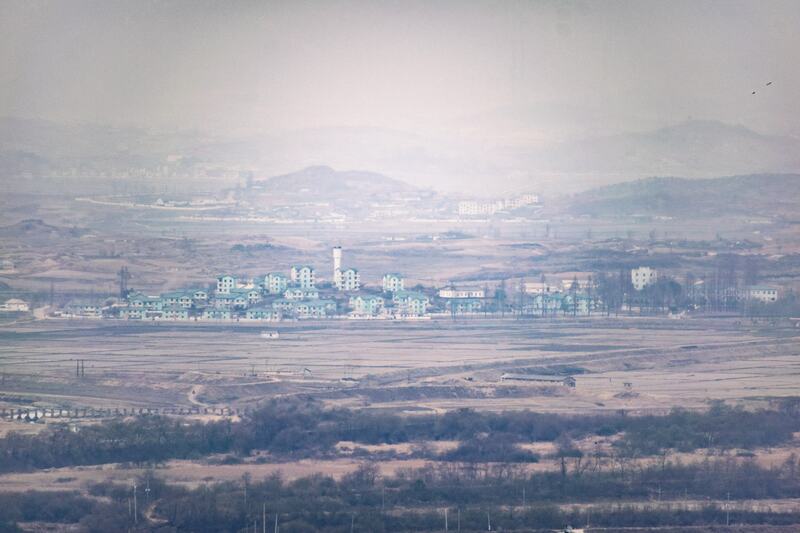 From the observatory you can see the North Korean propaganda village known as Kijong-dong, a complete village set up to fake how wonderful life in the North was to anyone looking over the boarder. Rumours have it that while the buildings are brightly painted and have electricity to appear inhabited, they are apparently little more than concrete blocks, lacking rooms inside and even glass in the windows. 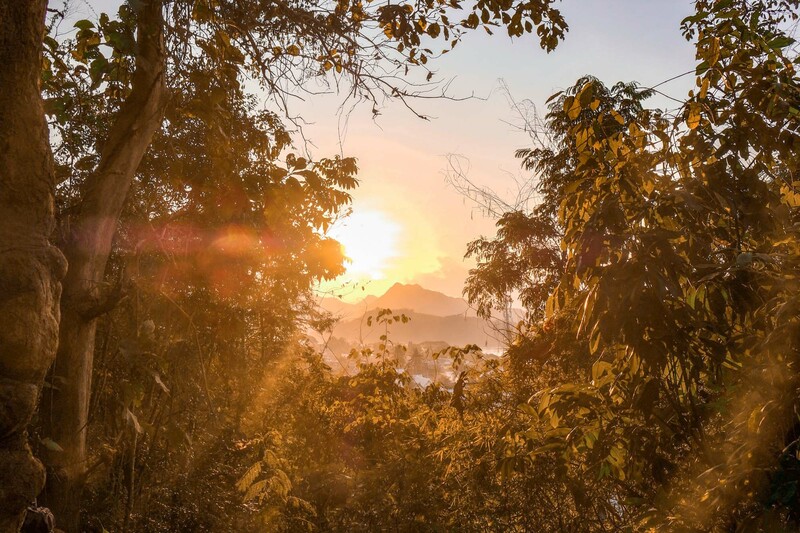 These days, this village is completely deserted, although it is said that the North still turn the lights on here at night to give the impression that the village is occupied. It might be one of the only places in the country that has lights on after dark. Ironically, where no one can appreciate or use it. The village of Daeseong-dong is also visible from the observatory. Daeseong-dong is a South Korean village although it technically sits over the North Korean border. 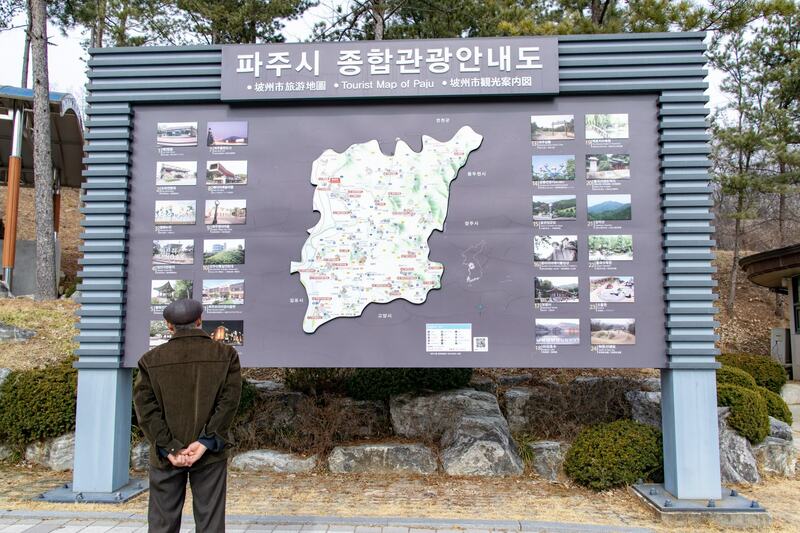 It was created as a peace town along with Kijong-dong in the North which were developed as part of the DMZ. Approximately 200 South Koreans still live in this town, despite it’s North Korean counterpart being completely abandoned. The towns of Kijong-dong and Daeseong-dong can be identified by a North Korean and South Korean flagpole respectively sitting in the middle of each town. Even when it’s not such a clear day, the flag poles are easily visible from the observatory. 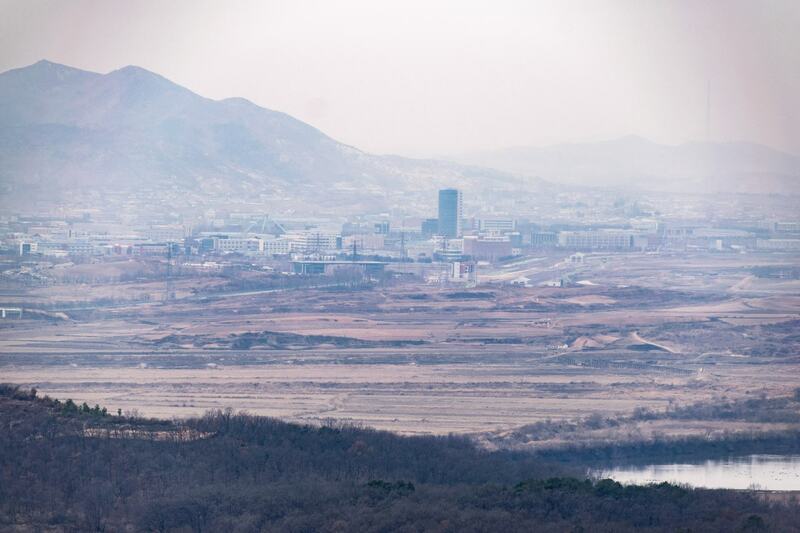 From the observatory you can also see as far as the city of Gaesung, which is the third largest city in North Korea and home to about 310,000 people. It’s an industrial city, home to some of the countries largest factories. On a clear day, you can sometimes even see the tall statue of Kim Il-sung that sits in the centre of the city. Just next to Gaesung is a very tall mobile phone tower, that works in the opposite way. It is called the Jamming Tower and North Korea uses the tall tower to scramble any signals coming into the country from South Korea. They don’t want their people to be able to watch TV shows, listen to the radio or hear any news that might be coming from South Korea. Hyeyoung told us that up until last year, giant megaphones used to sit at the Dora Observatory, that would project noise into North Korea. Sometimes they would share news or current affairs, sometimes anti-North Korean propaganda trying to convince locals that they should try and defect to the South, and sometimes they simply played k-pop or hit music across the border. North Korea would do the same thing from their side of the border, shouting North Korean propaganda and straight up lies over the border back at South Korea. In an attempt to try to further peace between the countries, the loudspeakers from both sides were dismantled in May 2018. 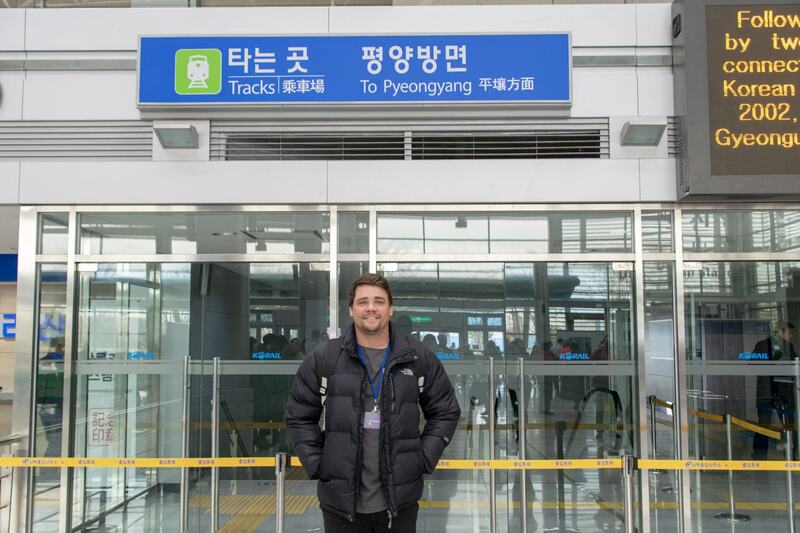 Our last stop of the morning was Dorasan Station, the last train station in South Korea before the North Korea border. 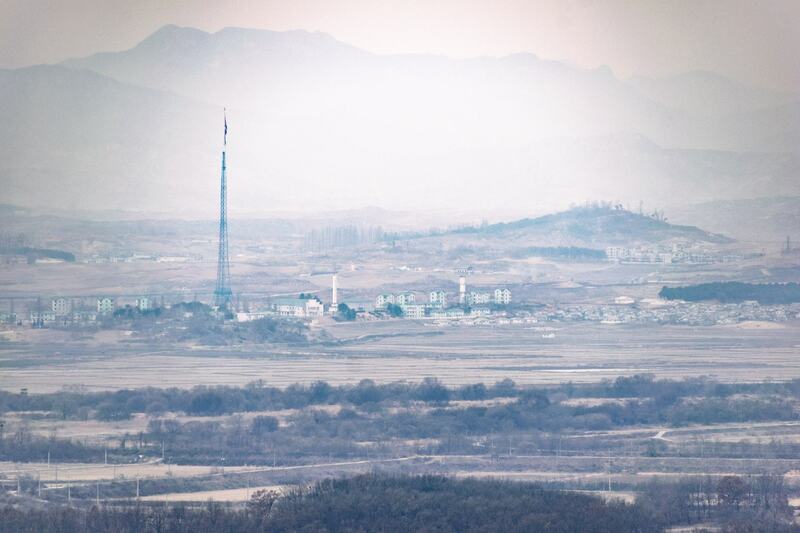 It sits about 700m from the southern boundary line of the DMZ. The station is set up as a complete international train station, complete with immigration and customs facilities, even though it has never been used as one. 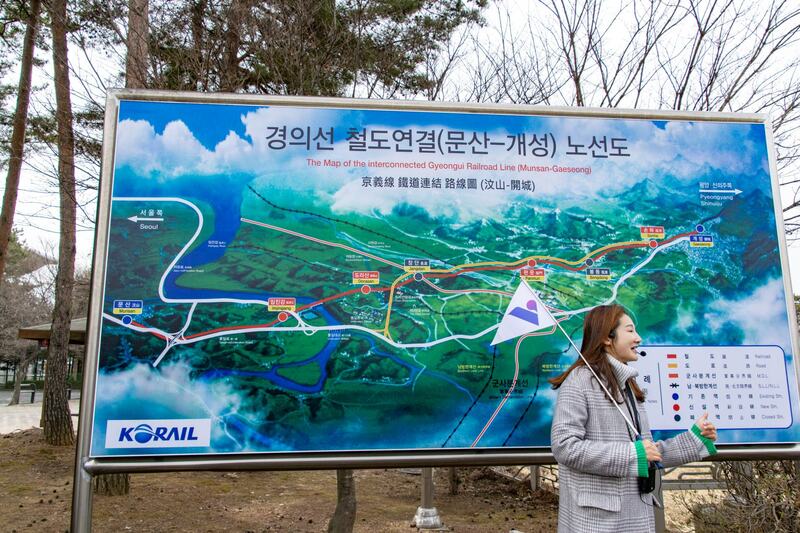 Due to the travel restrictions of South Korean’s into the North, the train line currently ends at Dorasan Station, although if it was ever opened it could connect South Korea with China, Russia and even Europe. From Dorasan Station it’s approximately 205 metres to Pyeongyang, the capital of North Korea. One of the most popular, although very difficult, places to visit in the DMZ is Panmunjeom, home to the Joint Security Area (or JSA). 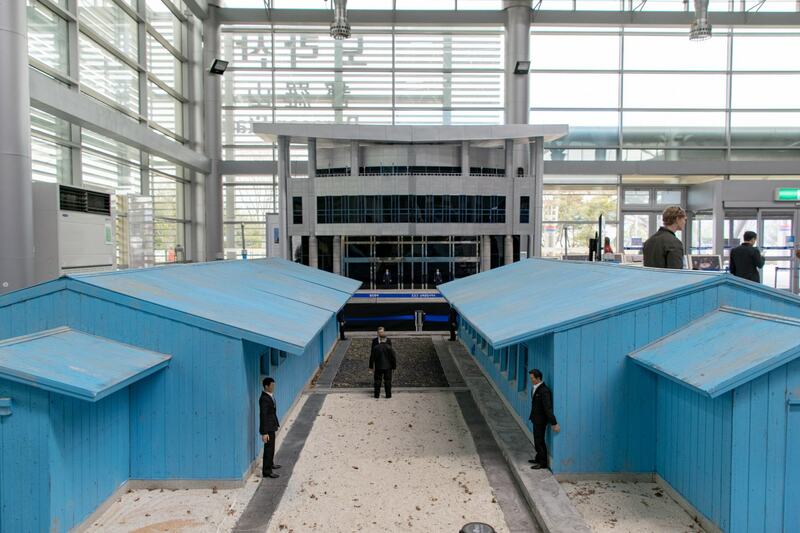 The JSA can be found near the western end of the DMZ and it is where negotiations take place between the two countries. This area is not actually owned by either country, but rather the United Nations have control over this area. Since it’s establishment in 1953 all negotiations between the two countries have been held in the JSA. It’s also the place when Kim Jong-un and South Korean president Moon Jae-in infamously met for the first time in 2018. This was the first time that a North Korean leader had crossed the military line since it was established. Finding a tour to the JSA has become increasingly difficult over the last few months, as peace talks have kind of fallen apart between the two countries. 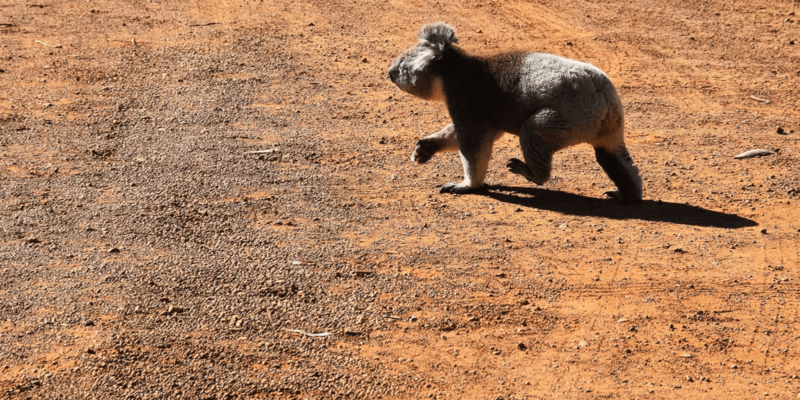 At the time we were booking our tour VIP Travel were kind enough to tell us that no one had been able to visit the JSA since November 2018, and although there was hope that it would open to visitors again, there is absolutely no guarantee. 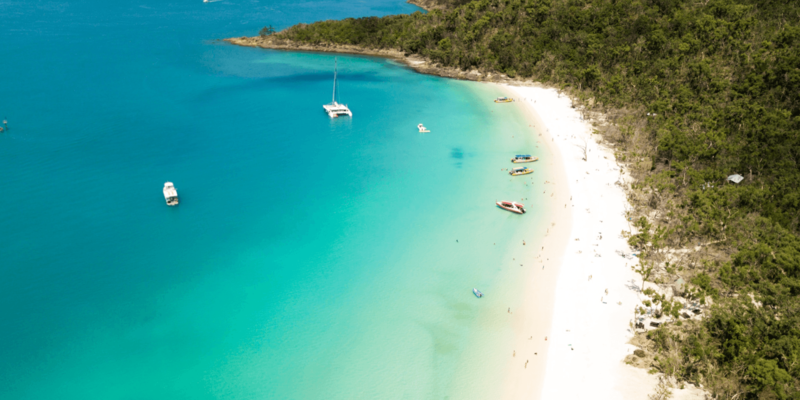 VIP Travel were the only tour company that gave us real, up to date information about the tour status, responding to my email within a matter of minutes. We highly recommend getting in touch with them to ask about your travel dates before you book any tours to the JSA. As the JSA is still used as a negotiating point between North and South Korea and can be such a hostile area, safety is of the upmost concern. There have been military and civilian casualties on both sides of the border at the JSA and it has become a more dangerous place to visit in the last few months. Please be aware that if you can find a tour that is still saying it can take you to the JSA, whether or not you can access it is actually up to the UN on the day of your tour. Most tours are being cancelled days, even hours before the tour and it’s likely that you will be left disappointed. If you’re going to book a tour that takes you to the JSA make sure they offer refunds if you don’t get to visit. Many of the companies we looked into said that if visiting the JSA was cancelled on the day of your tour you would only be charged for the regular DMZ tour, but double check just in case. VIP Travel looked after all of our travel arrangements for our tour to the DMZ, organizing our hotel transfers and out tickets on the day. The only this you need to remember to take with you is your passport, as it will be checked by a South Korean soldier on your entrance to the DMZ. 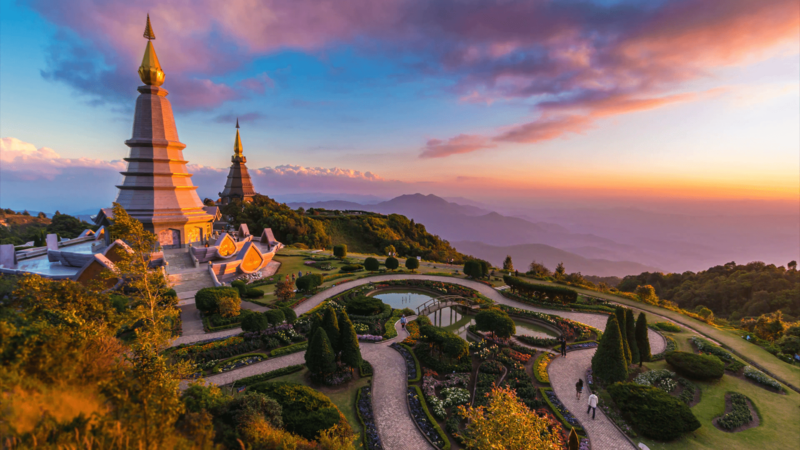 If you’re visiting during the colder months make sure you bring a warm jacket, as it can be extremely cool on the top of some of those observatories. There are a few different places to purchase food and snacks along the way if you get hungry, but it’s a good idea to pack a bottle of water and a couple of snacks in your bag just in case. 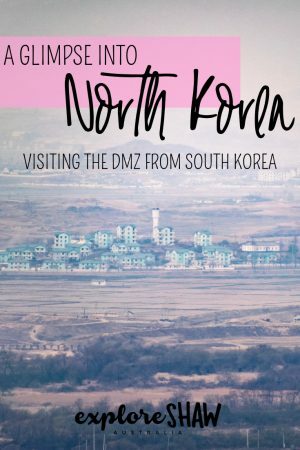 We had a great time visiting the DMZ with VIP Travel and could not recommend them highly enough to anyone travelling to South Korean and hoping to learn more about this iconic region of Korea. 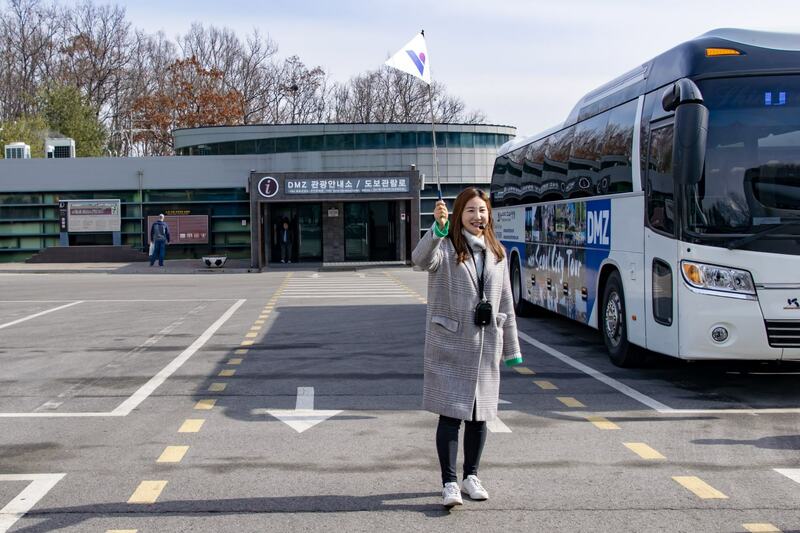 Hyeyoung was such a great tour guide, we learnt so much from her and she kept us constantly engaged all day, sharing her own personal stories about interactions with North Koreans she had met and other things she had encountered during her time as a tour guide to the DMZ. For more information about their tours or to book your own trip to the DMZ check out the VIP Travel website here and send them an email to find out if you can visit the JSA on your visit! We visited the DMZ as guests of VIP Travel. All opinions are, as always, our own.